Where are the links that were above the Tableau? When you open a new tab or click in the SmartBox , you see the Tableau — a panel with widgets of your most frequently visited websites. By default, the Tableau has widgets for some Yandex services. 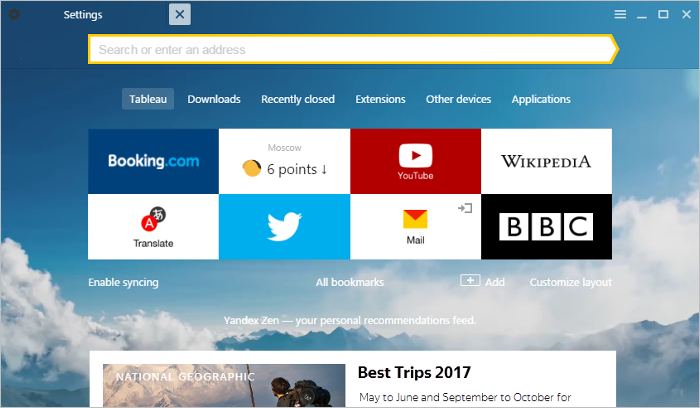 To navigate to a site, click its widget (it displays the logo and, if the widget opens a page different from the home page, the page name). where 1, 2... are the widget numbers on the Tableau (counting left-to-right and top-to-bottom). You can manually configure the set and sequence of widgets on the Tableau. Note. To make the widgets bigger on the Tableau, disable the Zen recommendations feed. During the installation process, the browser selects the sites for the Tableau based on the history imported from other browsers: the sites you've visited most often are added to the Tableau. If you haven't imported the history during installation, the Tableau displays the default set of sites. 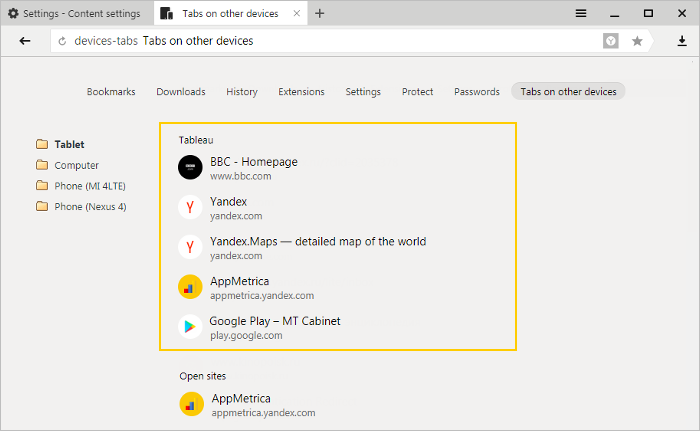 Yandex Browser periodically updates Tableau widgets that you have not pinned. It adds the sites that you most often search for in the SmartBox or open from the Tableau. Sites that have been manually removed from the Tableau will no longer be added to it automatically. To put a site like this back on the Tableau, add it yourself. You can group widgets into folders. 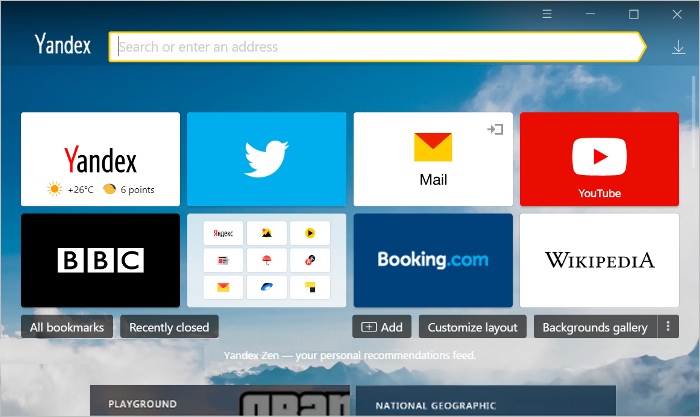 For example, widgets linking to Yandex services are grouped into a single folder by default. Under the Tableau, click Add → Folder. Click Add and specify the site. Note. 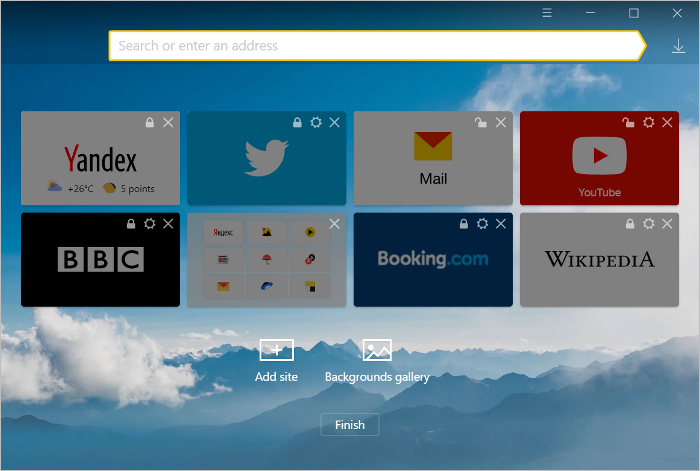 Repeat the action for all sites whose widgets you want to add to the folder. Hover the mouse cursor over a folder. In the upper-right corner of the folder, click . Under the Tableau, click Add → Site. Enter a site that you want to add to a Tableau widget. You can select a site from the lists of Popular or Recently visited sites, or enter an address manually. Restriction. You can place up to 20 widgets on the Tableau. Switch to the edit mode to manage the Tableau content. For a single widget: click and hold it on Tableau, or hover over the widget and click the icon on it. For all widgets: click Customize Layout under the Tableau. Attention. Make sure you save changes when you have finished editing. To do this, click Finish at the bottom of the screen. Change the site a widget links to Click and type the website URL in the box under the Tableau. Add the site name to a widget Click , then click Add Label under the Tableau and enter the site name. Edit the site name on a widget Click and edit the website name under the Tableau. Your Tableau is generated separately for each of your devices (since your favorite sites may differ on each of your devices). In the SmartBox , enter browser://devices-tabs/. Select the folder with the device name. Sites pinned to the Tableau are located in the upper part of the list that opens. That way the sites that are pinned to your Tableau will not display on your Other devices tab. If you reinstalled your OS and then your browser, the Tableau is updated and displays the default widgets. However, you can use syncing to view the list of sites that you pinned to the Tableau before reinstallation (syncing is linked to the device name). The Other devices tab opens. In the device list, click the folder with the name of the computer before you reinstalled the OS. You will see a list of sites pinned to the Tableau before the reinstallation. If the folder does not exist, then the name of the computer probably didn't change after reinstallation. In this case, your browser won't consider your computer a new device and won't display a folder with data before the reinstallation. You can rename your computer (go to Control panel → System and security → System → Advanced system settings → Name of computer) and then wait a bit for your data to sync with the server. Then go to the Other devices tab and open the folder with the old name of your computer. Widgets displayed by the Tableau change because the widget list is formed automatically based on your most frequently visited pages. Click Customize layout under the Tableau. Pin the widget by clicking the icon. If the “lock” icon is closed , the widget has already been pinned. Note. 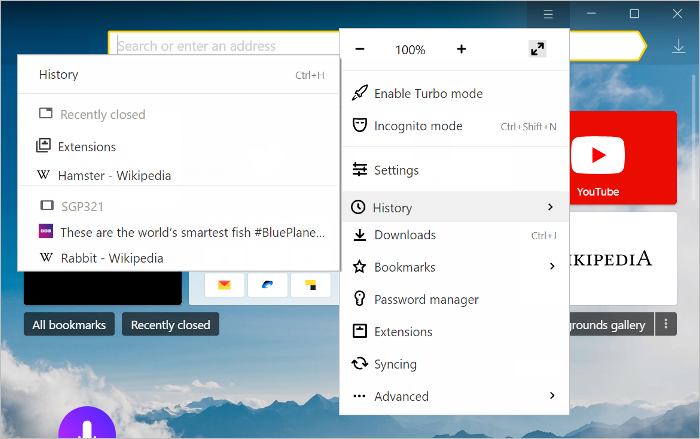 You can also pin a widget by selecting Pin in the context menu. Previously, there was a panel above the Tableau containing the links Downloads, Recently closed, Extensions and Other devices. The interface has changed. What is the Tableau?Automatic selection of sites for the TableauWidget folders on the TableauAdd widgets to the TableauEdit widgetsSync the TableauWidgets disappear from the TableauWhere are the links that were above the Tableau?